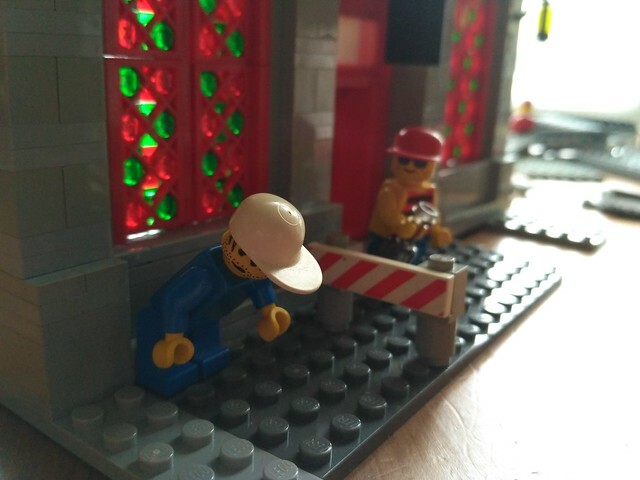 First MOC post, it's a work in progress of a pub. Still working on the ground floor for the time being. I'm using MLCAD (LDraw) just because I'm more familiar with it than LDD or stud.io, although I welcome any thoughts on that because I'm not entirely convinced it's the best choice. It will eventually be a real model but I don't really have much in the way of town/architecture parts so I'm designing in CAD first. From some of the issues noted below it'll become fairly evident that I have no experience in this area - I've built almost exclusively in Technic before so I may need some advice along the way! 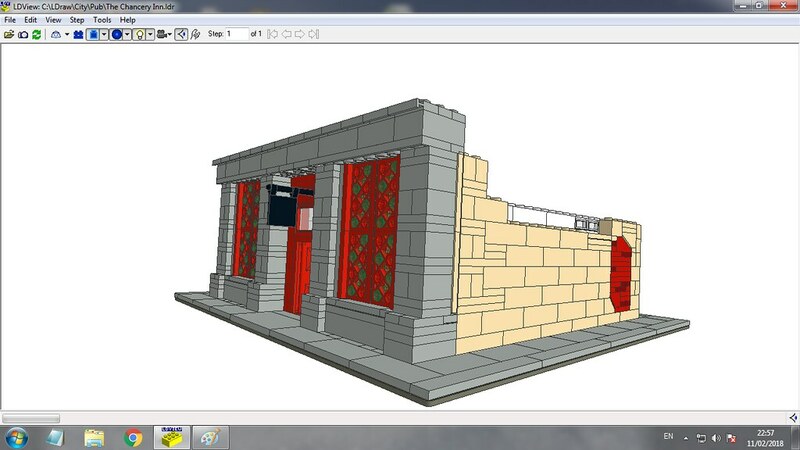 The front exterior is based on the Chancery Inn on Inns Quay https://goo.gl/maps/vxZyaA9R1oo. However the rest of it is just my own design. I didn't want to be tied down to a specific building. 2. I'm not entirely happy with the white interior around the outside of toilets and in the snug (much happier with the wooden bar interior area) but because these walls hold toilet fittings which are white I feel like they need to be white because the fittings will show through on both sides of the wall... Any suggestions welcome, open to totally rebuilding the toilets. In fact now I think about it I could try adding a basement and putting the toilets down there - the lack of a basement was bugging me a bit so I think I've just talked myself into it! 3. I wonder if it's foolish to have a completely studless floor. 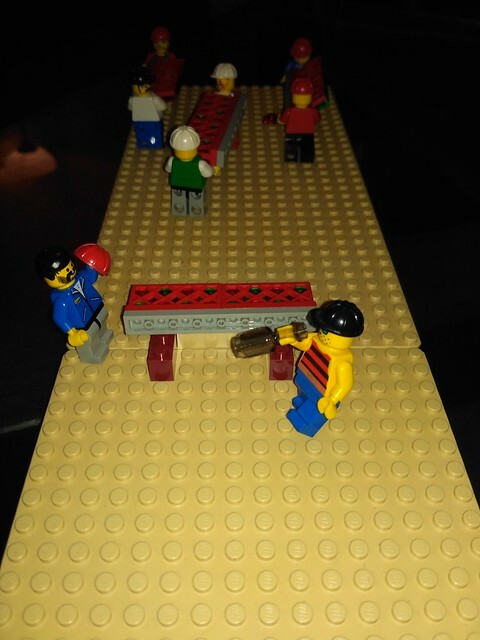 I was thinking I'd put in some free-standing tables and stools and all the minifigs could just be free-standing as well, but was this a bad idea? 4. At some point I'll need to add lighting, and this is an area I know absolutely nothing about whatsoever. Never had a Lego light in any shape or form so I'm literally fumbling around in the dark there. 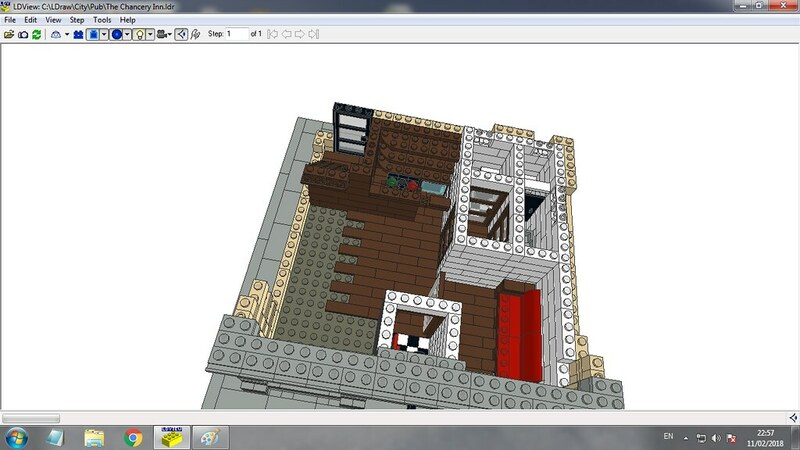 Looks like you have an excellent MOC in the works here. 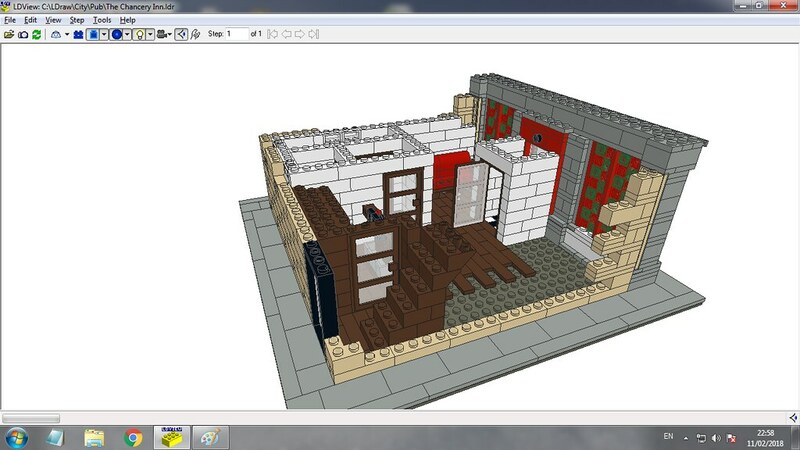 Really liking the general layout and you have captured a very realistic exterior. The use of plates in addition to bricks for the exterior wall, and the pattern it brings makes a great look. Liking the imperfections in the side wall, keep these going I say. 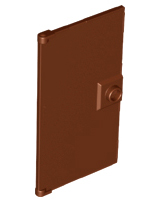 Agreed that the solid doors will look better. All you need is a Mna and Fir scribble. Regarding some of the issues, for me it would be easier to try find solutions in the brick rather than on MLCAD (you must have patience) as I usually try multiple things and often what I think would look best at first ends up not as good as something else. In general I think the white v brown wall contrast is a bit stark but for sure some old style pubs would have this décor with paintings or odd things hanging on the wall. I think the white looks great for the toilets though as these should be looking bleak right. Interested in seeing what the toilet fittings you mention are and whether they could be relocated or made slightly different to enable a different wall colour. I’m thinking you may have toilet paper holders or something but who knows! 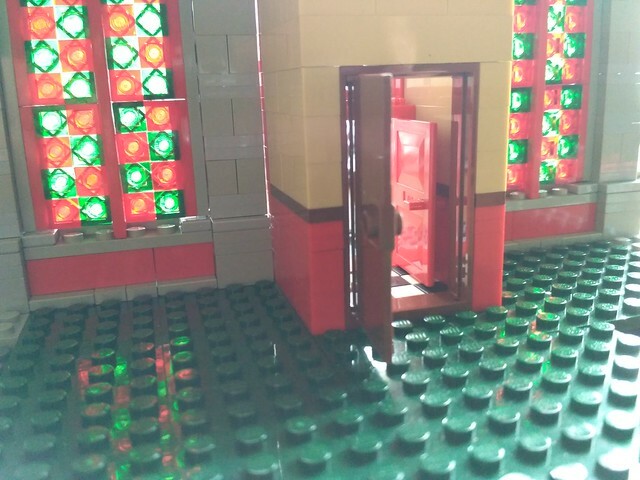 A basement would open up a lot of potential space to add detail and would probably simplify all the colour problems with the interior however being forced to work with the tight space you have here will make a fine MOC if you solve the various issues as it will surely have more character with the nooks and crannies. If you can post a picture of the toilet area that would be great. I think it’s a bad idea to have entirely studless footpaths or floors. I always add the odd 1x1 plate in the floor colour which can be used for furniture or figures. It can add a good imperfect effect (IMO) in any case (especially on footpaths). Best think in advance where you want to place some figures, eg around the bar and have those with the odd stud. I have some spare LED battery packs. Happy to give you one or more if you think they’d be useful. They take a couple of AA batteries. 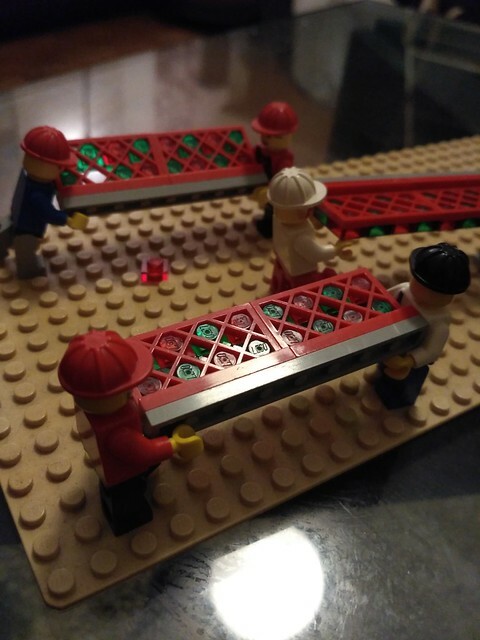 Personally the wire is too thick and difficult to accommodate the 20 or so light bulbs in a space-restricted MOC like this but if you intend on larger MOCs they could be useful. I used them here (about 17 of the LEDs are hidden in a riser). 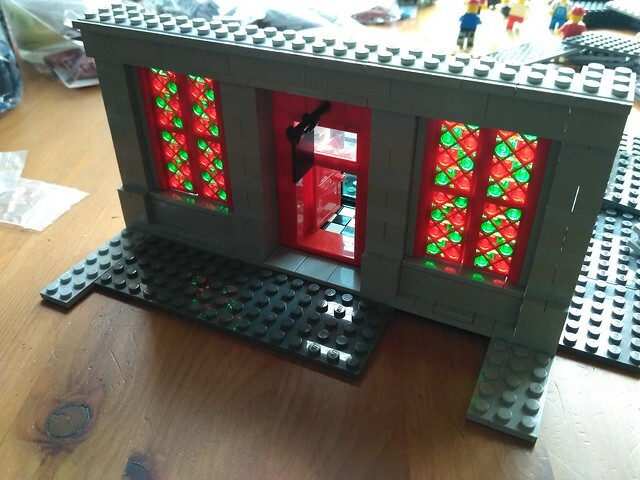 My recommendation would be to buy micro LEDs and have a complete circuit and power source on each floor (assuming this is modular). 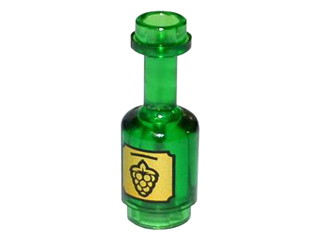 One option I am looking into is using cheap solar powered LEDs for this purpose. It's not so much patience as necessity! But yes it is a bit of a pain. I never had the patience for it with technic, but at least with town there are fewer things at angles and fewer keyboard-entry positioning adjustments! I'm thinking about switching to a carpet rather than bare floorboards, which would just be a studded floor with a bit of a pattern - it would solve the no-studs issue. I'll post some more pics soon, might not get back to it the next couple of evenings though. Are the LEDs you use actual Lego LEDs or non-Lego parts? Not that I'm too fussed either way, I just wouldn't know where to start looking for non-Lego ones either. Carpet idea sounds good. Looking forward to some more pictures. 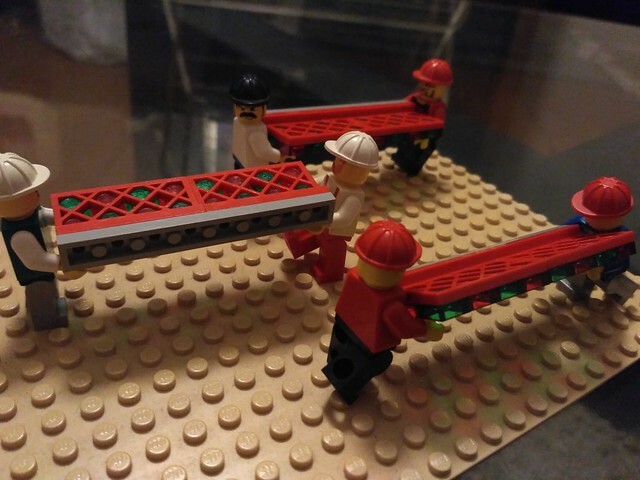 I would use non-Lego lights, more options, a lot smaller and a lot cheaper. Smaller versions of standard LEDs eg half or quarter the size. If you get hold of a soldering iron you could make your own circuits with very fine wire. I am yet to experiment with this properly but I suspect one could use the technic 1x1 brick with hole to good use as a means to hide wires in walls and use the 1x1 headlight brick as a breakout. If OK with the idea, drilling a few small holes might also come in handy. 1. The basement in full - you can't see much with the walls in place though. The private storage area will need some kegs and other bits and bobs that I haven't got around to putting in yet. 2. Going back in time a bit to before the walls were constructed so you can see into the toilets. 3. The front - now with the A-shape sloped section above the door, and a keg delivery hatch in the pavement out the front. 4. The bar - with taps, fridges, a clock, a dishwasher, a sink. Also there's a trap-door back there for basement access. Still not totally happy with the green carpet - it looks a bit like grass. 5. Some flags on the wall - I feel like it's that kind of bar. It pained me a bit making a Dublin flag but I don't think any other flag would have suited it. 6. There's a fireplace - no fire as of yet. 7. Lastly, I had a bit of space to the right of the fireplace that looked bare, but wasn't big enough for a table. First I looked to see if there's such thing as a dartboard-printed round tile (there isn't) but then I decided to get creative and this is now my new favourite part of the build. A Guinness toucan statue! Just like you I'm taking advantage of the days off work to build (LEGO and snowmen). Really loving those toilets. Don't forget to have no toilet paper. 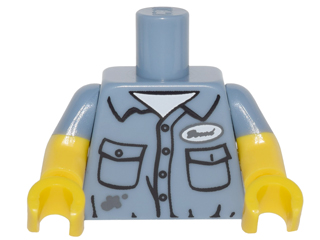 Minifigs won't be happy but its more realistic. Urinals look super, first time I have seen hand dryers. A partially sun damaged piece would work wonders here. I think you have the colour combinations done well but would probably change the green. Dark tan might look good but hard to say. Look forward to more updates and thanks for sharing the pictures Tom. They're definitely on the list! Not going to put that kind of thing into the ldraw model but I'll pick up a few of that kind of thing when I eventually start bricklinking all this stuff! Progress has stalled in the last couple of weeks, got a bit bogged down on the upstairs and it hasn't been helped by either the busy dodgeball calendar or getting into the really exciting part of the fantasy football season... Here's hoping bank holiday Monday yields some inspiration! The front on this pub is excellent. Have you a way of accommodating the A-shaped arch on the second floor? Samsonite, to answer your question, the angle is about 33° so I'm hoping inverted slopes over it will look ok! Not right that they have to work with long sleeves. Well, at least they are allow booze on the job. Progress on the front wall... some supply issues hindering progress around the rest of the pub though, as I overestimated some of my own inventory on some vital parts! A pub patron observes a resident of the Dublin quays. Interior of the front wall. I feel like a pint just looking at it! Coming along nicely.